Kanban Tool is a highly successful visual project management application for managing work and projects in line with Kanban, designed for Scrum & Kanban teams. Learn how to make most of it. Kanban Tool is a highly successful visual management application for managing work and projects in line with Kanban. Our Kanban software was designed especially for Scrum & Kanban software development and for project management. Kanban Tool lets you see the whole project at a glance on Kanban board. Our tool provides easy team collaboration in real time and makes everyone organized, no matter how big your team is. With Kanban Tool you can visualize business processes, manage projects and deliver outstanding results. Kanban Tool was established in 2009 and since then it is showing exceptionally strong growth in the global marketplace. Today Kanban Tool is the leading Kanban application for visual project management. One of the key strength is simplicity, intuitiveness, unique design resembling real Kanban board and bunch of unique features. We pride ourselves on providing outstanding customer service and the highest security and reliability of the service. Our customers say that it is probably the best Kanban tool in the market. Sign up now to empower your productivity and outperform your competitors. For more videos on using Kanban Tool, please visit our YouTube channel. Where can I find Kanban Tool User Guide or Kanban Tool Manual? Get started faster with the Kanban Tool User Manual. Click to view or download: Kanban Tool Manual. What features are implemented in Kanban Tool? A complete list of Kanban Tool features is available in the Product Tour tab. How often do you add new features to Kanban Tool? Kanban Tool's development process is based on our internal backlog. We have really great users and customers who regularly send us emails with suggestions of new features for future implementation. We read all the emails and really appreciate the feedback. Accepted ideas go to our internal backlog and we implement the most important and most often asked ones as first. Kanban Tool is constantly under development. We work hard to implement accepted ideas as soon as possible and we do our best to make a new version release every few weeks. I need some more knowledge on Kanban usage. Where should I search? If you want to learn about Kanban and of how to start using the method, please visit the Kanban Library. In there, you will find general introduction to Kanban, as well as carefully selected links to articles, blog post, pdf documents and books on Kanban boards, usage of Kanban in software development and operations, explanation of Kanban analytics and Scrum and many more. 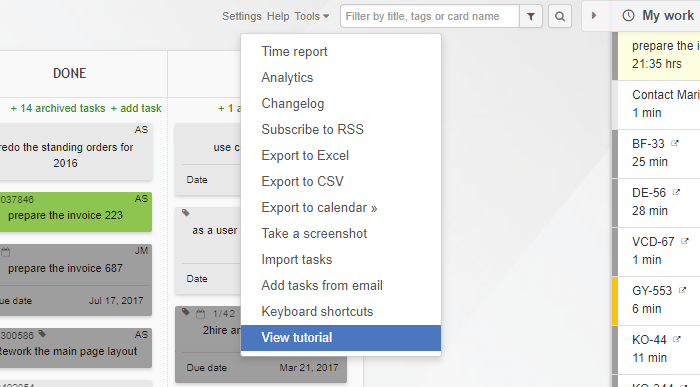 To speed up setting your own Kanban board, please view our express Board Tutorial - it explains how to use the boards and cards in Kanban Tool. You will find it in top right corner in the tools menu. Where can I find information about latest releases in Kanban Tool? We wouldn't want you to miss any new developments in Kanban Tool! All new releases are announced on Twitter, Facebook, Google + and - in the most detail - on our Blog. How to start using Kanban Tool and which board layout to choose? To get a quick overview of Kanban Tool capabilities, please view the Kanban Tool tutorial, available under the tools menu, visible in the top, right corner of a board view. You can create a Kanban board and then divide it into columns that reflect your workflow. You'll need to think of what steps each task needs to go through. The simplest set-up is: To do, Doing, Done. But most processes are a bit more complicated, for instance: To do, Waiting for approval, Approved, Doing (divided into sub-columns: Buffer, Working), Quality Assurance, Done. Usually it's best to begin with the available board template and start as simple as possible. When creating a new board, we suggest choosing the "basic" or "time driven" board and adjusting it to your needs as you get going. Changes can be made at any point in time, so that the board can always get suited to your process. Also, we recommend you to read the Kanban Tool User Manual. You will find there guidelines on how to create your first Kanban board and how to start using Kanban Tool. Do you have any use case examples? Yes - you are welcome to view all detailed Kanban Tool implementation examples here. To learn of specific stories from our Customers, please view Use Cases. How do I save my board? Kanban boards update automatically - there is no need to save anything manually. If you're looking for quick tips on how to make the most out of Kanban Tool - make sure you're aware of the below features. Knowing them may save you time and further increase your productivity. & Task Summary to name a few. What is the difference between the Team and Enterprise plans? & Process Automation, which offers extensive ability to make dependencies between actions on your board, i.e. automatic in-depth card edits and custom notifications. All of these features are only available in the Enterprise plan. as presented on the product page. How do I activate Time Tracking? Note, that Time Tracking & Reporting are only available on accounts using the Enterprise service plan. To see what plan your account is on and to change it, please go to Account Administration - Plan & Billing details. Time Tracking will get activated for any task, that is moved to an "in progress" type of column. It can also be manually activated, under right-click on a closed task - "Start timer". To make sure, that your board's "In progress" or "Working" / "Doing" column is indeed of an in progress type, go to the board Settings - Board Editor and click the pencil icon under your "working" column. In there, you'll see what Lane Type has been set for the column. You can read more on Time Tracking configuration here. Sharing projects with groups of people can be done successfully with use of folders. Folders can be created in the dashboard - with the "create folder" option. Any number of boards can be placed in a folder. When a folder is shared with a user or a number of them - they automatically gain access to all of the boards within this folder. This is a great way to control which teams within an organization have access to what sets or types of projects. How to create a task card? At double-clicking on an empty space within any column, a new task creation pop-up will appear. You can use this method to insert a task between other tasks too. 4. Task creation via email. 5. Task creation via API.